A lot of players think the matchmaking system is based entirely around trophy counts; that's not true. In fact, it takes into account your BH level, defensive, and offensive capabilities. As a max BH3, I saw plenty of low-level BH4s. As a low-level BH4, I am seeing plenty of mid-level BH4s. That means I am facing opponents who have dropped all the new items, even run a few upgrades, and are therefore much more difficult to defeat with BH3 troops. I get that this is just part of growing up, but it still makes things a bit harder when you screw up and miss a whole day of playing. And man oh man did I end up losing a lot! LOL. BUT...you lose less than you gain in trophies, and there are always those really bad attackers you can count on. BTW...have I ever mentioned how much I hate the Sneaky Archer's AI? It's problematic throughout, but when you're the underdog at BH3, it takes on a special spotlight at the center of problems. You can set them down right in front of a structure to attack and they will simply walk off to the sides and ignore it, then walk into the middle of the base - past everything - and get all shot up. It's mind boggingly bad AI and the single most frustrating aspect of this entire game. 8 attacks later and I had won my 3 lootable attacks, with 170K/286K in the bank. 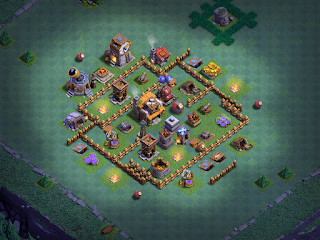 I used about 80K to drop all of the BH4 defenses except for the Air Bombs and the Guard Post, as well as to clear a little space on the game grid for a new base design. I trophy pushed for a bit, but I'm pretty sure my game-brain was fried; I ended up doing all sorts of stupid things and my final trophy count was right back where I started. I was double teaming with my BH5 game running. I hit level 10 Baby Dragons tonight on BH5 and that's just ridiculous OP. I went from 2200 trophies to 2800 trophies without much effort. It still took a few hours, and I had to get the hang of their AI but it wasn't bad. I might actually call it fun, but don't spread that around. This inspired me to start using my level 8 Baby Dragon on my other BH4 game and I'm so-so on that one at the moment. It seems to do ok, but having two per camp rather than 3 per camp, and the lesser HP/DPS makes just enough of a difference as to keep it balanced at BH4 against most players who develop their air defenses. Same goes for BH5. Of course, most players are rushing both and do not develop their air defenses well, or they place them as junk on the outer perimeter of their base. You can quickly run into trouble if the opposing player has dropped all air defenses, placed them more centrally, and upgraded them. A 51% two star will beat a 99% one star any day.